Gum recession (Gingival recession) happens when the margin of the gingiva retracts or is lost, thus exposing the root of the tooth. Why should I treat my recession? Gingival recession is classified into different classes. Results will depend on the initial classification, the cause of recession, and patient factors. Ask Dr. Shwetha about what results you should expect. You can also look at pictures of treated cases in our Gallery. Some people show excessive amount of gum whether at rest or when they smile. This is known as a gummy smile. How do I treat my gummy smile? The treatment of a gummy smile depends on the cause. In cases of incomplete eruption of teeth, or failure of gingival margin migration, the periodontist can perform a surgical procedure to place the gingival margin in its ideal position, make the teeth as long as their ideal size, and have the gingival margins appear harmonious and symmetrical. Sometimes a dual approach is indicated, your dentist and the periodontist can work together on establishing an ideal smile using periodontal surgery along with veneers. Ask Dr. Shwetha about your options. A pocket refers to a gap between the gums and teeth. This gap is the result of periodontitis and acts as a safe place for bacteria since it is impossible to clean with conventional cleaning methods. The pocket is often ulcerated on the tooth side, this results in bleeding gums and acts as a path for the bacteria to invade the tissues. Luckily, general dentists, as well as other specialists, are well trained in identifying periodontitis. 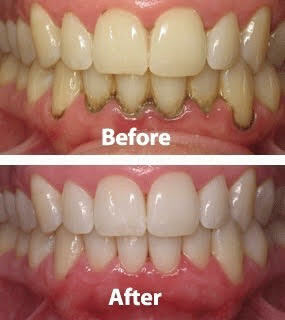 Your dentist will evaluate your periodontal condition and refer you to a specialist if further treatment is indicated. Research shows that people who develop periodontal disease and don't receive treatment are at far greater risk of losing their teeth than people who do receive treatment. Not only does periodontitis affect oral health, but there is also undisputed evidence that periodontal disease is a risk indicator of cardiovascular disease. People who have periodontitis are more likely to suffer from strokes and other cardiovascular diseases. The mechanism of this relationship is complex and not quite understood yet. Some of the theories describe a heightened inflammatory condition in the whole body due to bacterial insults in the periodontal tissues. What is the periodontal treatment? Over the last century, dentists and periodontists have developed multiple treatment modalities to treat and control periodontitis. Non-surgical therapy consists of scaling and root planning (deep cleaning). This removes most of the local factors that cause the disease, including bacterial plaque and plaque infected calculus. Surgical therapy, however, remains the treatment of choice for advanced periodontitis. Different surgical techniques are applied by the periodontist. The aim for surgical intervention is to either re-establish lost tissues (Regenerative periodontal treatment) or to stabilize the dental condition (Resective periodontal treatment) allowing for proper hygiene and maintaining teeth. Ask Dr. Shwetha about which treatment is best for you. Surgical Laser Assisted New Attachment Procedure, known as LANAP, is a state of the art technology that allows us to replace the conventional blades and sutures to disinfect the mouth and treat periodontal disease. Dr. Shwetha is highly qualified and has advanced training in multiple lasers, including Nd-YAG and Er-YSGG lasers. Treatment options will be discussed in details after clinical and radiographic exams, diagnosis, and prognosis have been established. Why do I need a crown lengthening? In certain situations, the margin of a filling or a crown lies under the gums. This can be the result of deep decay that extends beyond the gums, a fracture in the tooth, or to engage enough tooth structure to hold a restoration. If the margin of the restoration is too close to the bone surrounding the tooth, this will result in constant inflammation, and bone loss. The bone loss might be in what is called "Negative Architecture" meaning contrary to the normal shape of bone. The effect of a bone loss includes deepened pockets, continued loss of support to the tooth, and/or gum recession. 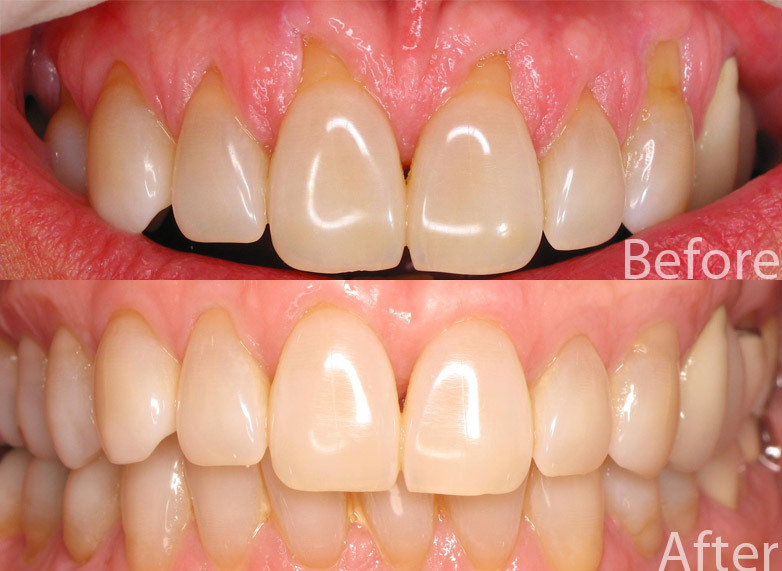 Crown Lengthening is a minor surgical procedure that aims at making the tooth longer, thus allowing for the safe distance between the restoration and the underlying bone.